Vega’s completion is highlighted in this photo series, beginning with the “upper composite’s” move to the Spaceport’s SLV launch site on a special transporter (photo at left). This component subsequently was hoisted to the appropriate level of the launch site’s mobile gantry, positioned over Vega and then integrated with the light-lift vehicle (center and right). Another Vega launcher has completed its assembly process, marking a major milestone as preparations continue for Arianespace’s 11th mission of the year from Europe’s Spaceport in French Guiana. 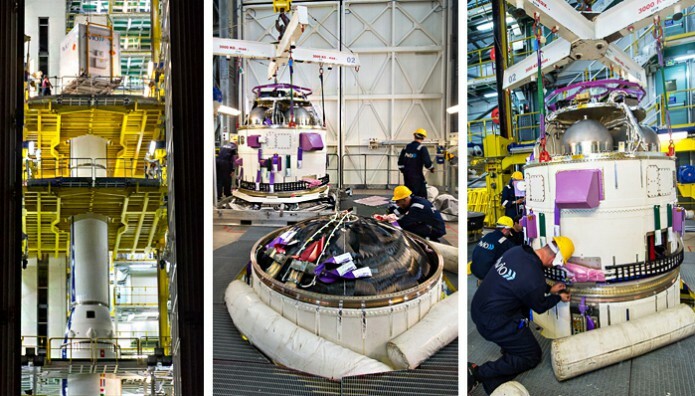 This activity concluded with the integration of Vega’s “upper composite,” which consists of the LISA Pathfinder scientific space probe passenger and its protective payload fairing. Installation took place at the Spaceport’s SLV launch site, inside the facility’s protective mobile gantry. The lightweight Vega is one of three launchers operated by Arianespace from French Guiana, along with the medium-lift Soyuz and heavyweight Ariane 5. Its development was performed in a multinationally-financed European Space Agency program, with the vehicle’s design authority and prime contractor role performed by Italy’s ELV company – a joint venture of Avio and the Italian Space Agency. Vega entered service in February 2012, and its five missions to date – all successful – have orbited a variety of payloads, ranging from Earth imaging satellites and climate change observation platforms to technology demonstrators and an experimental spaceplane. LISA Pathfinder was developed in a European Space Agency (ESA) program and built by prime contractor Airbus Defence and Space. Produced to study the ripples in space-time predicted by Albert Einstein’s General Theory of Relativity, it will be placed in an initial elliptical Earth orbit on the December 2 Vega mission – which is designated Flight VV06 in Arianespace’s numbering system. The spacecraft’s own propulsion module will then be utilized to reach the operational orbit around the first Sun-Earth Lagrange point (L1) – located approximately 1.5 million kilometers from Earth. LISA Pathfinder’s total liftoff mass is estimated at 1,906 kg.